The inhabitants of Cottbus, Germany have criticized the transfer of American tanks through their city. While speaking with Rundfunk Berlin-Brandenburg radio station, they called the move a "provocation" and demanded an end to the confrontation with Russia. One of the city's residents noted that tanks going to the East "horrified him" and reminded him of his childhood when columns of German soldiers moved towards the western border of the USSR. He believed that Warsaw's statements about Moscow's possible "aggression" are "clearly exaggerated." "I do not believe that Russia would attack Poland," the man told the radio station. The US tanks have been transported toward Polen today as well. Here at Cottbus train station. Another respondent said that Germany hasn't even tried to maintain dialogue with Russia. He said that the military build-up near the Russian border is "wrong" and called it a "provocation." Another Cottbus resident demanded that Germany's "so-called friends" should "get out" of German territory. "I do not know how long Putin will just watch all this. We must develop a friendly dialogue. We do not need a confrontation," the man said. Wenn Ami-Panzer von Deutschland durch Polen auf Russland rollen, interessiert das keinen. Aber wehe, w. Russland das umgekehrt machen würde. — Garion Coyote (@GarionCoyote) 12 января 2017 г. No one is interested when American tanks are moving from Germany through Poland to Russia. But what if Russia would do it visa versa. @weidenkatzl @puffyka81 2000 Panzer und 5000 Soldaten aus den USA über Deutschland an die russische Grenze!! — Horst Hövels (@HovelsHorst) 26 декабря 2016 г. ​2,000 tanks and 5,000 soldiers from the USA via Germany to the Russian border!! A total madness!!! — DerDerDaIst (@aotto1968_2) 17 декабря 2016 г. 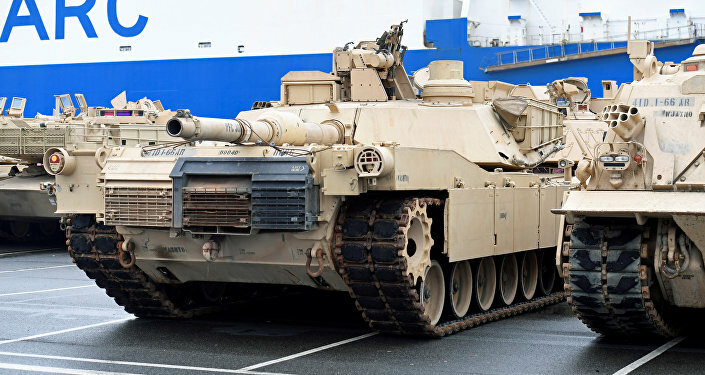 On January 6, 87 Abrams M1A1 tanks, 20 Paladin artillery vehicles and 136 Bradley fighting vehicles arrived in the German port of Bremerhaven. The United States also plans to deploy 50 Black Hawk, 10 CH-47 Chinook and 24 Apache helicopters, as well as 2,200 personnel. The newly-arrived military equipment will be distributed across Bulgaria, Estonia, Germany, Latvia, Lithuania, Poland and Romania for training, exercises and maintenance. As a pretext for its military build-up in Eastern Europe, the US has used claims of alleged Russian military interference in Ukraine, which Russia has repeatedly denied. The military equipment is supposed to be a part of NATO's mission to contain alleged "Russian aggression" against Baltic States and Eastern European countries.